What is the best way to care for hand knits? This is a question I get asked again and again, and now seems like the perfect time to talk about this as I am about to introduce the new range of Luxury Yarns Hand-Dyed. We spend hours and hours making our items – either knitting or crochet or perhaps even weaving. We’ve picked out gorgeous yarns and paid hard earned cash for them, the last thing we want is for them to shrink or for the colours to run. There are lots of things to consider when taking care of luxury yarns and this will vary depending on what they are made from but here are some of the ways I try to ensure my items stay looking new. Are the colours likely to run? This is particularly relevant with hand-dyed yarns – due to the process, residual dye will often remain. This is normal – and not restricted to hand-dyeing – jeans for example will run for several wash cycles and I’ve even had pairs that make my hands and legs go blue throughout the day. However, with jeans it’s easy to remedy because they can just go in the machine, and generally we don’t mind so much when they start to fade. 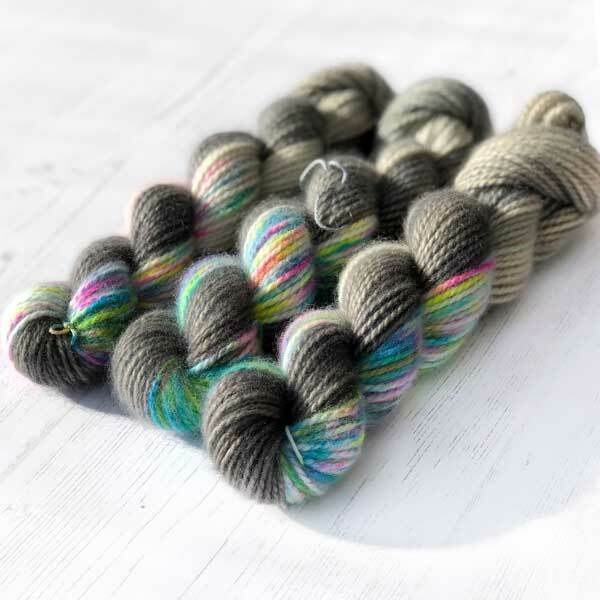 Bright colours in your yarn are another matter altogether. I generally advise washing all finished items made with hand-dyed yarn in cold water before they are worn, and in fact the yarn bands will say this. If you are going to block your garment, you could do this first. In the case of brighter colours, particularly blues and reds I would advise a colour fixing soak. If you have noticed any colour transference on your hands while working with the yarn then this is particularly important. Use a large bucket and fill with around 5 litres or a gallon of water. Add 75g salt and 250ml of white vinegar. These ingredients will work together to lock the colour. Make sure that the ingredients are well mixed and the salt is dissolved. Add the garment to the water and leave to soak for 24 hours. You may notice some colour has run into the water but this wont matter. Pour away the solution, rinse the bucket and fill with fresh clean water. Rinse the garment to remove any vinegar smell. Hopefully the water should now stay clear. If colour is still running repeat step 1 again. When you are happy that the colour is fast you can drain the water, place item on a towel. Roll up the towel and gently squeeze out any excess water. I strongly recommend this process for all our Shreya Silks and Luxury Yarns Hand-Dyed Yarns. Soak Wash– this is available from several stockists worldwide – I get mine from my friend Deb at Find Me Knitting. Hand washing doesn’t get any easier than this – you just fill a bowl or sink with luke warm water. Mix in the Soak liquid and then add your woollens and leave to “soak” for around 15-30 minutes. No rinsing is required. Place the item on a towel and roll up. Gently squeeze out any excess water and leave to dry flat. Machine Wash – only do this if your machine has a special wool or hand wash cycle. Make sure that the temperature is set to 30deg or below and use a special wool detergent, or better still my new favourite – EcoEgg. The most important thing here is DO NOT SPIN! At least not above 400rpm. The fast spin-cycle is what agitates the delicate fibres and will cause your knits to felt and shrink. This is another grey area – some people say don’t because you will flatten the stitch detail and I’d certainly agree if you have very delicate stitches and purl bumps, however, ironing on a cool heat can fix a number of issues and is great if your item has lost it’s shape and you don’t have time to re-block. I regularly iron both wool and silk but ALWAYS ensure that the iron is on the minimum setting.